This week was my first true first week. Confused? I started as a mid year teacher last year and never really experienced the beginning of school jitters at the actual beginning of school. To say that I was nervous is a complete understatement. One – I couldn’t sleep the night before. Three – I thought I forgot how to teach (luckily, I did not). The amount of panic I actually feel towards all the “teaching stuff” i.e. anything but actually being in front of the room, is boggling me. Why are lesson plans so hard right now? Why can’t I make a smartnotes file!? Why is constructing a homework assignment taking me an hour? Why are my goals and objectives so muddled – I wrote the curriculum for this course last year and I already taught THIS EXACT SAME CLASS! Why can’t I learn any of my students names – I mean I have one class full of Sam’s, Nicole’s and Stephanie’s so the odds are in my favor. Basically, I’m a wreck. Thankfully, when I get in front of the students it goes away but the problem is I need the planning to be solid to have a solid block. I just don’t know why every little task feels so large and I feel so inadequate and overwhelmed. Back to the point at hand. We received a grant and a call for ideas went out to staff. We are given an opportunity to pioneer a truly original and educational experience for students in our school. Isn’t that every teacher’s dream? Hey – teacher there, we’ve got this new grant and you can pitch ANYTHING and we might consider it! What do you want to do? I feel like there are more reasons than simply a lack of creativity stopping me from replying to my boss’ request for club, summer program, etc. ideas. For one, I’d have to lead the group, I’ve never been in charge of a club, especially a new one. I am truly scared of proposing an idea and then not having a single clue on how to follow through. So I believe my brain has decided to do me a solid and completely shut down on any good idea. I figured perhaps my twitter and blog buddies might want to share their freedom and money ideas if only to see them wobbly implemented by a (second year?) teacher who will definitely cry for help once a month. So – if you had a million dollars (yea, right) what club, resources, program, would you implement at your school? I really did not want to think about teaching this summer at all as evidenced by my complete hiatus from blogging and twitter. Don’t hate me, let me back in to your circle! I swear I’ll read and comment on all of your latest blog posts… OK I’m begging now. To get right down to it – I’ve begun working again. Okay, to be really honest I’ve been working for the past thirty minutes of this entire summer and I already need your help. Shocker. Next year I am teaching all seniors (YAY!). Semester PreCalculus like last year and new for me Statistics. As I am writing my Stats syllabus I am thinking about the most effective course supplies for my students. I struggled with this last year too. Previously, I asked them to bring binders divided into three sections: Warm ups, Notes, Classwork. They had to complete out of class work outside of the binder (i.e. homework on loose leaf to be turned in). There were several problems with this system. The only benefit was that warm ups were important. I am not certain this would be lost completely if they just completely everything in one notebook, but I did like that warm-ups had their own section. It provided for some helpful classroom management at the beginning of class. Thoughts? What do you use in your classroom? What have you used in the past? What do you wish you could use? Do you think I should provide some structured freedom since they are 12th graders? What happens when you stop participating in twitter and blogs for 2 months? You attempt to read them and catch up in one day. I couldn’t sleep last night. I want to do IT ALL. The good news: I still love being a teacher. The great news: I want to be a fantastic awesome math teacher like YOU! (specifically calling out these posts – Infinite Sums, @crstn85 , @jruelbach @mgolding). Spiral Notebooks for ALL notes. Table of Contents at the beginning, students number pages of their notebooks. Titles and dates on top of each (RHS?) page. Up for debate – warm ups on LHS, sectioned off and above work done for the day. Returned, graded homework in separate folder. Projects and more involved projects will need to be done outside of the notebook due to grading policies. The notebooks will stand as a more interactive way to take notes and be involved in direct instruction and guided practices. It will also be a place to store hand outs and glue in interactive activities such as matching, puzzles, dominoes, etc. Next on my agenda: A review board like @mathymcmatherso has with 5 problem review cards for students to do in down time or to focus on certain objectives. Graffiti Graph-iti Wall. That was an amendment made by kids. Students had filled in their own unit circles (measuring the angles with protractors etc. 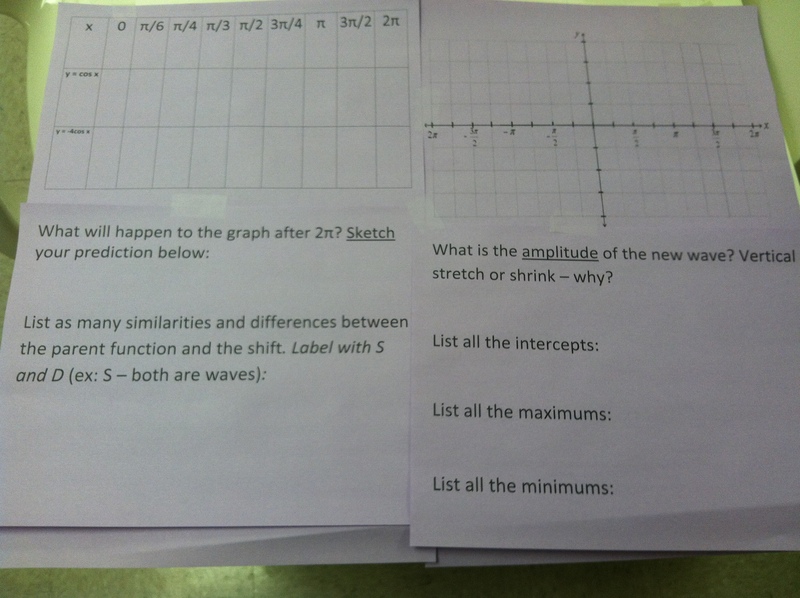 ), created charts to help them easily identify the sine, cosine, and tangent of all the angles, and worked out several unit circle problems. We began our journey with this “guided notes”/discovery activity. I won’t lie – the intent was students would move seamlessly from their unit circle into this x/y table and plug in and graph away. They would work individually or with a partner discovering and having a grand ol’ time. Uh no. With my two lower level classes I did need to provide more scaffolding. I started off with a simple x/y table of a line and reminded them how we chose the values for x and so on. Then I placed this table on my smart board and explained I had chosen my x values as certain angles around the unit circle and we used the unit circle to find the y values. I also drew a “regular” x/y plane with 1,2,3 but then explained those are not my x values so it doesn’t make sense… and so on. The students did a fantastic job after the appropriate scaffolding and continued the project for the rest of class and then for homework. 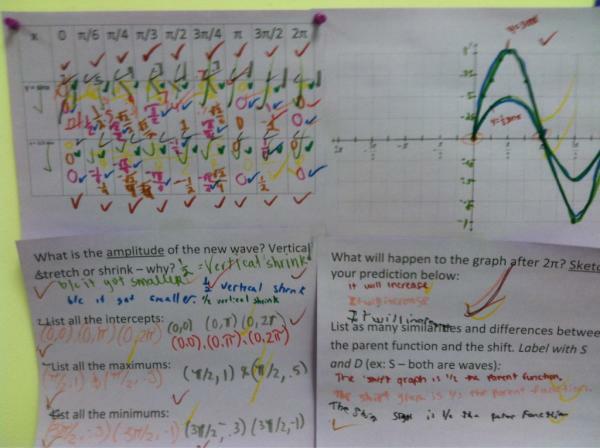 The next day we practiced graphing with the Graph-iti Wall. All around the room I had placed different charts like the one below. Students began at one station and were timed for 5 minutes. Everyone had a marker and everyone had to write. Everyone had to write, even though they were writing the same thing. They did as much as they could until the timer rang (or the music stopped, I couldn’t get my music working though!) and then faced the center of the room. The next task was to head to the next station and check the work completed before them. They had to actually check off each answer and again everyone was checking off then they could move on from where the last group left off. They rotated around to about 4 stations and then were sent back to their original to see what happened. There was a lot of writing – in fact you could barely make out the first group. Hence the graffiti idea. It’s an awesome activity for anything multi-step and I look forward to doing it again! Students got the amplitude and vertical stretch/shrink DOWN after this activity – which made teaching period (horizontal stretch/shrink) easier without the confusion of the “inner” number and “outer” number. PEAK has the “six keys” model and one of them is safety – you can provide, break or use the safety key in the classroom by doing certain things. I thought a lot about how true and accurate my formative assessments are or could be based on the safety my students feel in my classroom. Raise your hand if you see the next step. I will not call on you if you raise your hand. Ok, hands down. Please raise your hand if you’d like to explain what you notice. It worked really great. A lot of students felt safe to raise their hands and let me know they see something (depending on the phrasing sometimes I asked raise your hand if you’re thinking of something that MIGHT work, etc.) but are not ready to share it to the class. I have also been using thumb signals to determine if we need more examples, ready for individual practice, or how to proceed within the lecture. Today I asked them to close their eyes (and to actually do so out of respect for their classmates) and show me their thumbs. I saw a lot more thumbs down today than I have yet. I am really excited for the feedback my students are giving me and am thrilled that I am learning how to create an environment that protects their safety and allows them to tell me what they need in many different ways. I keep reading articles, blog posts and asking my coworkers how they communicate with the whole group and I’m eager to hear more ways. A quick post today. My block three was bad – I had two kids get in school suspensions for the things they said to me in class. They were rough. Now, after returning from 2 sick days they asked how I was, said they missed me, and am really glad I got better! They also said a really mean teacher had my coverage. But I thought I was the most evil teacher in the building? You? No way, you’re really nice. And there you have it. A month of detentions, rules, structure, high expectations and a month of meeting me at those standards and now hey – I’m nice! Rad. How do you take the temperature of your classroom? My principal had a lot of great feedback to share with me – all of the students were engaged, my DI examples were scaffolded nicely, my transitions were excellent, students stayed on task (i.e. my pyscho evil Ms. P management style is starting to pay off). The students worked well together and the activity was clever and creative (Thanks Kate!). The one piece of feedback that I found most valuable was the feedback on what I need to work on – assessment. Mainly during my lecture and direct instruction time. He indicated the questions that I am asking during this time are not meaningful and don’t lead to valuable feedback from the students. I am not getting a true indicator at any given moment whether the students are following or not. He said there are lots of ways to determine if students are understanding the examples and if I need to do more, to do less or to move on. He made me a copy of Madeline Hunter’s chapter on signaling for understanding and the four useless questions teachers ask – “Do you understand this – Any questions?” (whoops). And I think he’s totally right. I don’t know how to gauge the temperature of my classroom at any given time as a group. I need a meaningful way (or multiple ways) to determine if I can pick up the pace or need to slow down. How do I know if they’re ready to go off and do individual or group work? How do I know if they learned this last year? What meaningful questions should I be asking to help them tell me what I really want to know? How can I get more feedback from the class rather than just the same three students who want to tell me they’re lost or they’re following along? He told me about “thumb signalling” and I tried it and it sort of worked – but how do I determine how many side ways thumbs are enough to do another example? Is that just something as a teacher I have to decide for myself? How do I help those two students who always have a sideways thumb and yet we continue to move on – how do I make them feel like their feedback is valuable even though it might look like I’m ignoring it!? So basically – what are the questions, signals, or other ways you get feedback from your students during direct instruction that allow you to determine the level of understanding as a big group? How do you use this feedback to alter your instruction?